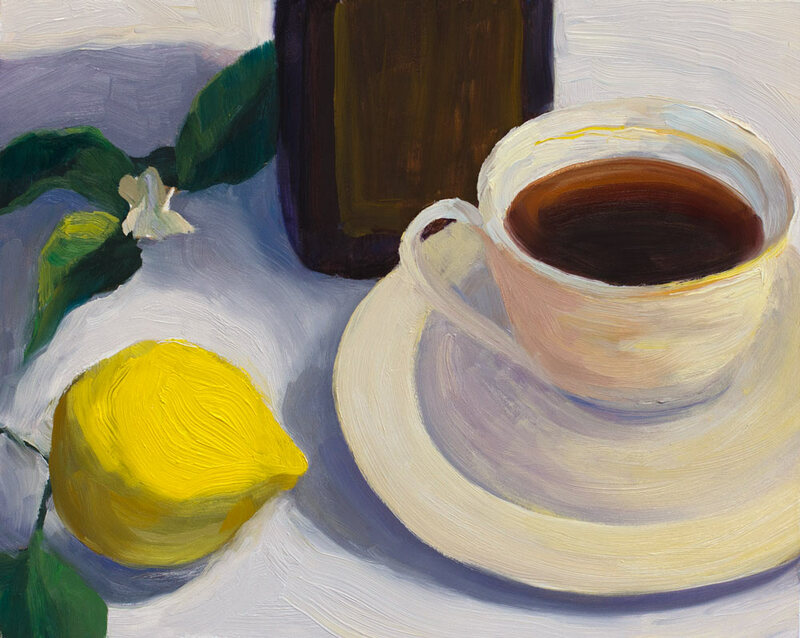 Tea and Lemon, Surface Quality Study #1, oil painting on panel 8x10"
This painting is a study based on the exercise in Peggi Kroll-Roberts “Surface Quality” video. I watched the video, then turned it off and painted from my still life set up, trying to incorporate the lesson: paint the darks with thin paint (so that they recede, don’t reflect light that hits lumpy edges, and don’t draw attention to themselves) and paint the light areas with rich, thick paint (and of course mix the correct colors and values). When Peggi demonstrated this exercise she used a cube of butter (in her still life, not to paint with! though her paint is very buttery). I had to replace the butter with the yellow lemon because while I brewed the tea in the other room, my cat had a little feast, licking my only cube of butter into a misshapen mess. There are some passages in this painting I like very much, such as the lemon, its leaves and blossom, the tea, and the way the tin in back is kept all in shadow. I did buy another cube of butter to try the exercise again, and that will post tomorrow while I’m off at Peggi’s workshop. I like the colours and the cut-off shapes, but I do think you could have put the tail of the cat into the picture somehow! Loved the cat story…everything i seem to paint lately has dog hairs in it…so why not a cat tail? OOPS PS I do like this VERY much…GREAT job! I love the cup. That was the first thing I noticed. Lovely shape, texture and color. And the composition is good too. Well done. I like this very much! Someone else already commented about the cut-off shapes, but I second that….I like that effect. Have a wonderful time at your workshop!!! I can’t wait to see more buttery paintings from you! The first thing I noticed was how well done the tea cup was. I love the painting and the cat story! It’s a good thing they have 9 lives. Wonderful painting! I like the cup too. Your cat eats butter??? My cat will smell everything, but turns his nose up at anything that isn’t meat! Well done, Jana. I finally watched that dvd today, and it looks to me like you nailed the exercise. I can’t wait to try it. What a wonderfully solid painting. I love the dark bottle that anchors the picture and the subtle reflections that bounce off its side especially at the bottom left — you are so astute about observing these small effects that evoke the poetry of the objects. The cool blue/warm yellow contrast is very pleasing. The lemon has as much dignity as a person, is almost a portrait. And the tea looks so fabulous. I want to drink it. Love this painting! What a wonderfully solid painting. I love the dark bottle that anchors the picture and the subtle reflections that bounce off its side especially at the bottom left. You are so astute about observing these small effects that evoke the poetry of the objects. Thank You for sharing. Have a look at paintings for sale as they also showcase some great paintings. I really like this. the lemon and the flower are particularly nice.